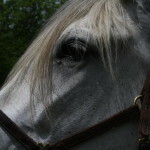 When Ilustre came to us he was one of the most challenging horses I had worked with. He had been deemed dangerous and unrideable and was explosive under saddle, and would rear and bolt and leap through the air without warning. This was a result of rough training that had taught him to be afraid of people. It took a lot of patience and love to teach him that it was ok to trust again. It was essential to build a strong relationship to help him learn to work with people again. So I started going into the barn early in the mornings and working with Ilustre at liberty. 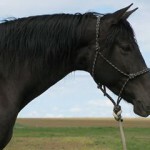 This helped me connect with him without the distraction of saddles and bridles, or the pressure to perform. I found that the best way to earn Ilustre’s trust was to simply spend time with him, enjoying each other’s presence. 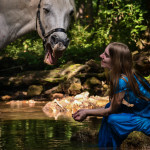 It was liberating to have no particular goal in mind, but simply to enjoy the presence of my horse and the presence of God. In these quiet moments we learned to simply enjoy life. Slowly Ilustre transformed into the incredible partner and brilliant performer that he is today. We now have a great partnership based on trust, respect, and love. 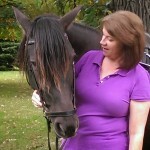 When we got Anna she had never been handled before, had never even had a halter on. It took a long time and a lot of patience to teach her that people were ok. As with Ilustre, the groundwork was essential. 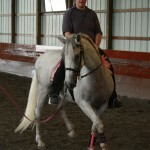 We did a lot of lunging and liberty work with her, teaching her to relax and be comfortable with us. Anna also had never been seperated from her mother or left the farm she had been born at so she had a lot of seperation anxiety issues. Over time we were able to build her trust and confidence. Her fun loving, flashy personality has developed and she loves being the star of the show. 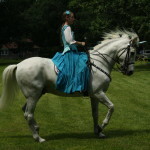 She has participated in several clinics and demonstrations. 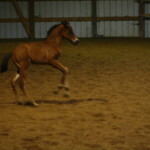 This past Spring she did her first long reining performance. She is learning how to Spanish walk, which she quite enjoys. 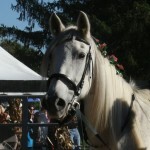 Maia is an eight-year-old Andalusian/Lusitano cross. She is smokey black in color meaning she carries the dilution gene. This can be seen in her dorsal stripe and the striping on her legs. Maia is sweet and sensitive and loves to please. 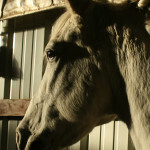 Maia came to us from a farm in South Dakota where she had been born and raised. It was quite an adjustment for her to go from a quite farm in the middle of nowhere to a bustling barn in Wisconsin. 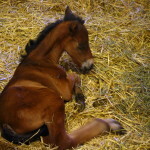 She came to us having been lightly started and ridden a handful of times. 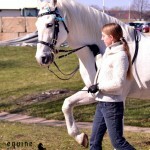 We started with groundwork- lunging and work in hand and then progressing to long reining. We’ve also done liberty work with her to build her confidence and trust. 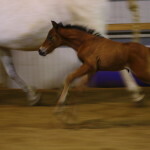 She is a quick learner and it was not long before she was working under saddle. 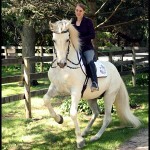 Maia continues to develop- learning lateral work and progressing in her classical dressage training. 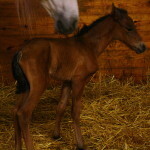 Anna’s first foal, Ariel, was born on February 17th. Ariel is already developing quite a personality. 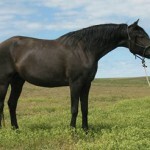 She is curious and outgoing and loves to run, jump, and practice her levades. We are excited to watch her grow and are looking forward to the education opportunities we will be able to offer as she progresses with her training.